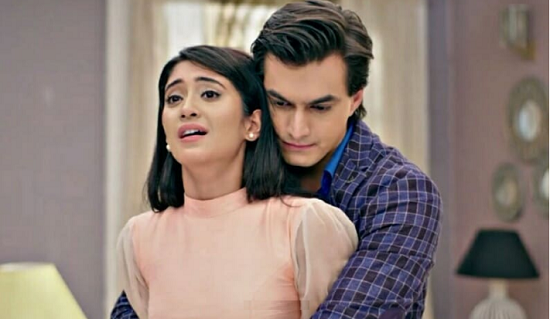 Kartik Naira Yeh Rishta twists. Kartik has made Naira much upset. He has confessed love to her all the time, but when he refused to marry her, she doesn’t know what does his love mean. She doesn’t want to support the love, which doesn’t get a name through marriage. She is much angry on Kartik. Kartik heads to Singhania house to convince Naira. Naira doesn’t pay heed to him. She ignores him. When he tries to come close and express his love, she reminds him how he has broken her heart. She doesn’t want to talk to him. She bounds him in a promise that he will never cross his limits to force his love on her. She asks everyone to play the dhol, since she is very happy. She fakes her happiness for the sake of family and dances in the holi party. Kartik and Naira celebrate Holi with their families, while throwing a lot of attitude around. The families try their best to unite Naira and Kartik. Kirti feels upset that she is the reason for all the problems. Kartik asks her not to feel guilty and promises to win Naira back. Naksh tells them that he wants Kartik and Naira to end their differences and marry soon. Gayu and Samarth join Singhania and Goenka family. They are also on a mission to unite KaiRa. They spike Kartik and Naira’s drinks so that they forget their differences and reconcile. Gayu values true love a lot. She doesn’t want lovers to stay distant. Kartik convinces Naira with his love. Samarth realizes Gayu’s qualities. He bonds with her. Dadi gets a feeling to talk about their alliance. Samarth and Gayu’s track will be commencing in the upcoming track. Krishna is falling in love with Veer. Though she doesn’t express it openly, Veer senses her feelings by her gestures. Krishna is planning Veer and Shivani’s marriage. She didn’t imagine that she will realize her feelings for Veer. She covers Veer’s name on her hand from everyone. Veer is hopeful that Krishna will admit her love till he reaches the marriage mandap. Veer plans to marry Krishna, while defending her respect from Shivani’s evil plans. Krishna gets touched by Veer’s gesture when he saves her from the humiliation arising from her wardrobe malfunction.